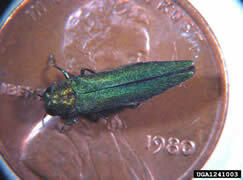 On July 20th a press release was issued by the Connecticut Agricultural Experiment Station (CAES) and the Department of Energy and Environmental Protection (DEEP) announcing that the Emerald Ash Borer (Agrilus planipennis) was found in Prospect and Naugatuck, Connecticut by staff members at CAES. The emerald ash borer (“EAB”) has been responsible for the death and decline of tens of millions of ash trees, from the mid-west to New York State and south to Tennessee. Connecticut now becomes the 16th state known to have EAB within its borders. The Connecticut discovery was made as part of a program that closely monitors a native, ground-nesting, and non-aggressive wasp (Cerceris fumipennis) that hunts the emerald ash borer as well as other beetles in the Buprestidae family. 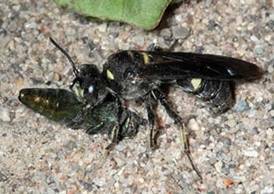 The wasp catches beetles in often inconspicuous locations such as tree canopies and brings the paralyzed beetle back to its ground nest to feed to its larva. “Wasp Watchers” is a biosurveillance program made up of trained observers (many of them volunteers from the UConn Master Gardener Program) who watch over these native wasps and collect the prey they bring back to their ground nests. Cerceris caught the emerald ash borer in New Haven County and a Wasp Watcher found the EAB as it was brought back to the wasp’s nest. The nests are often found in large colonies of independent burrows, the active wasps are capable of presenting the human observer with many buprestid beetles in a single day. These colonies are frequently found in areas disturbed by human activity and are easily accessed for surveys. Sandy soil along the edges of playgrounds and baseball fields located near forested land often shelter the wasps’ nests. Fortunately, Cerceris fumipennis is an easy going wasp and it appears that association with the Wasp Watchers is not detrimental to the wasp. Cerceris fumipennis show no inclination to sting humans even when their just caught prey is taken. No one is sure how EAB entered Prospect or Naugatuck, but the movement of infested firewood has been previously linked to the spread of this invasive pest into other states. To prevent further spread of this and other invasive species, do not move firewood long distances, find local suppliers or purchase kiln-dried wood that is certified to have been treated to destroy insects and pathogens.